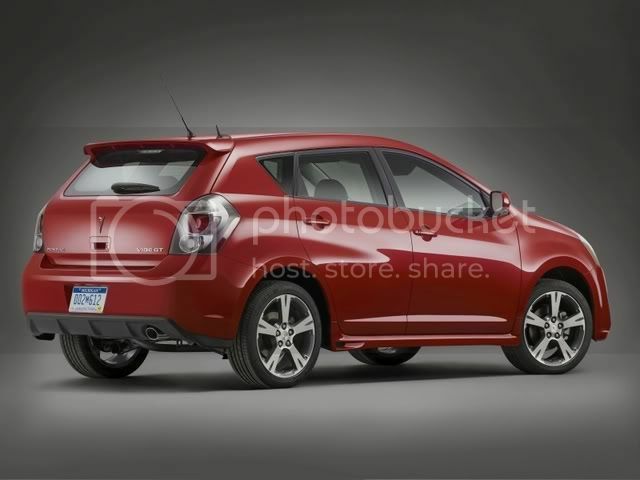 The all-new 2009 Pontiac Vibe is a modern re-mix of a classic hit, infusing the functionality of a compact crossover with a bolder attitude of muscular styling, increased performance and tight handling. It arrives in dealer showrooms in early 2008.Adding a richer harmony to the tune, the popular all-wheel-drive and GT models return to the Vibe lineup. Regardless of the model, each Vibe offers a level of athletic design, boosted performance and everyday versatility uncommon in the price range. Packing more off-the-line power than ever before, the ’09 Vibe delivers the type of responsive performance needed to safely navigate those unexpected everyday driving situations. A 132-horsepower (98 kW) 1.8L DOHC four-cylinder is standard on base models and delivers 128 lb.-ft. (174 Nm) of torque. The engine benefits from dual variable valve timing, optimizing both performance and efficiency, and is matched to a standard five-speed manual transmission or optional four-speed automatic. Customers desiring higher performance can opt for the larger, 2.4L DOHC engine with 158 horsepower (118 kW) and 162 lb.-ft. (224 Nm) of torque. The 2.4L engine is standard on AWD and GT models, and is optional on the base model.A four-speed automatic transmission is standard on the AWD. Customers of the 2.4L-equipped base or GT models can choose between a standard five-speed manual transmission or a new, five-speed electronically controlled automatic transmission featuring Driver Shift Control (DSC), which delivers a great combination of performance, fuel economy and smoothness. With DSC, the driver can manually select gears via tap up/tap down controls. With the 1.8L engine and the standard manual transmission, EPA fuel economy is estimated at 26 mpg in the city and 32 mpg on the highway; with the automatic, fuel economy is estimated at 25 in the city and 31 on the highway. The 2.4L engine on the GT is estimated at 21 mpg in the city and 28 on the highway with the manual transmission and 21 city/29 highway with the five-speed automatic. On the AWD model, the 2.4L/four-speed automatic combination delivers an estimated 20 mpg in the city and 26 on the highway. Driving dynamics of the new Vibe have been refined to deliver a responsive driving experience, with a special focus on reduced noise, vibration and harshness. An array of chassis control systems enhances ride and handling, as well as safety. The Vibe has a body-integral structure with underbody rails running from front to rear, giving the structure exceptional strength and a strong foundation on which to anchor the suspension systems. All models employ a MacPherson-strut front suspension design. The base model has a torsion-beam rear suspension that is revised for a more comfortable ride, while the AWD and GT models use a multi-link independent rear suspension for even sharper responses and enhanced driving control. Four-wheel disc brakes with ABS are standard on all models, as is electronic stability control and traction control. Steering control is augmented with an electric power steering system, providing variable-effort performance and (because there is no engine-driven power steering pump) enhanced fuel economy. The Vibe has the looks to back up its performance. With a lean, athletic form, the Vibe’s new exterior exemplifies the future of Pontiac’s design - clean, purposeful shapes and a decidedly sophisticated aesthetic. The new Vibe’s appearance melds the space-enabling design of a small SUV with a forward-looking profile, furthering the groundbreaking design pioneered by the original Vibe, launched in 2002. Vibe’s three models - base, AWD and GT - are distinguished from one another with unique styling cues. For example, the AWD features a standard roof rack perfect for outdoor activities. The GT has its own front fascia - with larger fog lamps and lower-fascia air intake - rocker moldings, roof spoiler and a bright exhaust tip. All models offer distinctive wheel options. 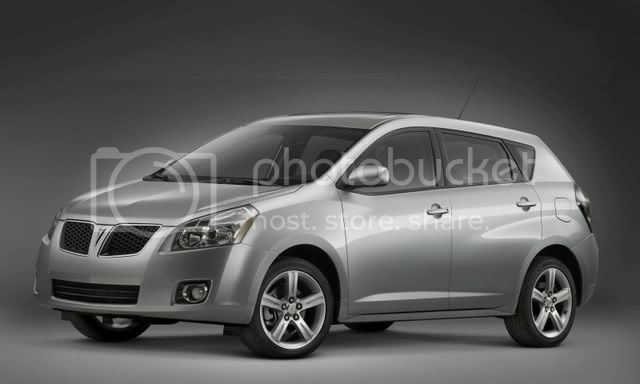 Like the exterior, the ’09 Vibe’s interior is all-new and has a driver-focused cockpit design more common to sports cars. The controls and gauges were redesigned for easier use, but retain a performance-oriented look and feel; and the interior quality and craftsmanship are reflected in class-leading gap/flush tolerances. Interior material refinement is also stepped up a notch in the new Vibe, with a combination of low-gloss materials, varied grains on the instrument panel and other trim components, and satin-metal accents. New, knit-fabric seating surfaces are durable and have a premium look, while GT models are enhanced with standard leather-trimmed seats, three-spoke steering wheel and shift knob. Seating for five is standard on all models. 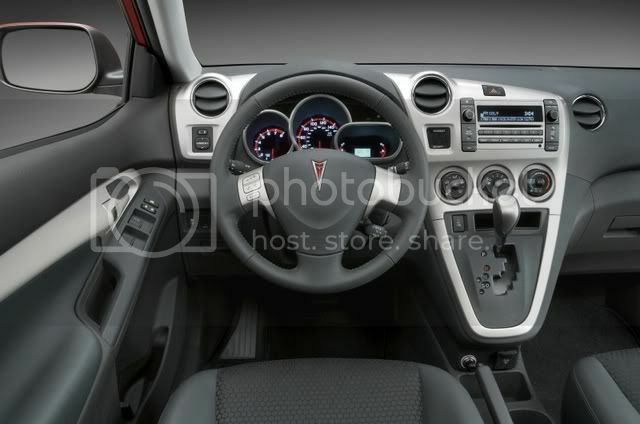 The Vibe’s interior also is loaded with standard amenities not typically found in other vehicles in the segment, including a steering column with telescoping/rake adjustability; a 115-volt, three-prong auxiliary power outlet, six-way adjustable driver’s seat and front active headrests. All Vibe models come with an AM/FM radio with CD and XM Satellite Radio. The XM band is integrated for seamless switching between all three signal bands. An auxiliary audio input jack is standard, too, allowing the MP3 players and other portable devices to play through the Vibe’s speakers. A four-speaker sound system is standard on Vibe base and AWD models. True audiophiles can step up to a premium Monsoon™ 320-watt audio system, including MP3 capability and seven-speaker sound. The Monsoon system is standard on GT models and available on base and AWD as part of the Sun and Sound package. Vibe’s roomy interior provides generous storage space for all kinds of stuff, starting with a 60/40-split rear seat that folds flat to create 49.4 cubic feet (1,399 L) behind the front seats. Rubberized cargo floor strips help prevent items from sliding. Additional storage solutions are offered from an oversized glove box, an overhead console, a dual-tier center console and other integrated cubby holes located throughout the vehicle. A rear cargo compartment storage organizer is standard on all models equipped with a 2.4L engine (optional with the 1.8L engine) and provides an almost unlimited number of cargo solutions, thanks to a multitude of hooks and net-divided compartments. It also conveniently folds into the floor when not in use. Vibes equipped with the 2.4L engine also come with a fold-flat front passenger seat that expands the interior’s storage versatility - for times when you need to haul a ladder, small kayak or other long items. Sixteen-inch wheels and touring tires are standard on base and AWD models. Seventeen-inch aluminum wheels are also available on these models, featuring a bright machine finish on the base model and chrome-clad finish on the AWD. The Vibe GT comes standard with 18-inch bright machine finish aluminum wheels and 215/45-series all-season performance tires. 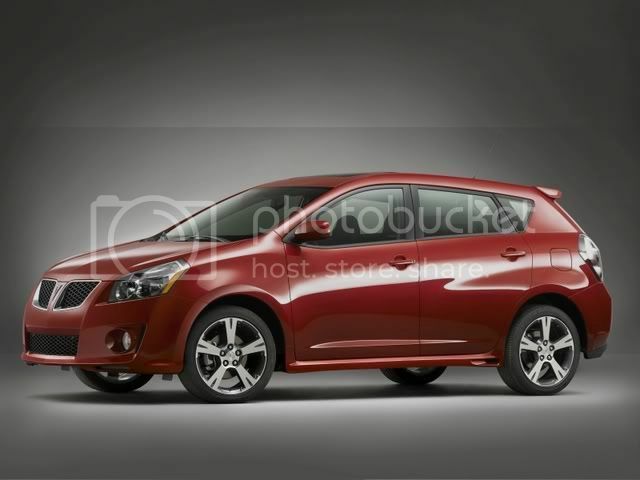 The new Vibe was designed from the outset to be one of the segment’s safest vehicles, with a comprehensive system of design and technology features that help protect occupants before, during and after a crash event. The standard OnStar system’s digital equipment includes enhanced hands-free voice recognition capabilities, including more intuitive continuous digit dialing and improved voice recognition accuracy. Using the GPS satellite network and wireless technology, OnStar features core safety services and OnStar Hands-Free Calling, which allows drivers to make and receive voice-activated phone calls. 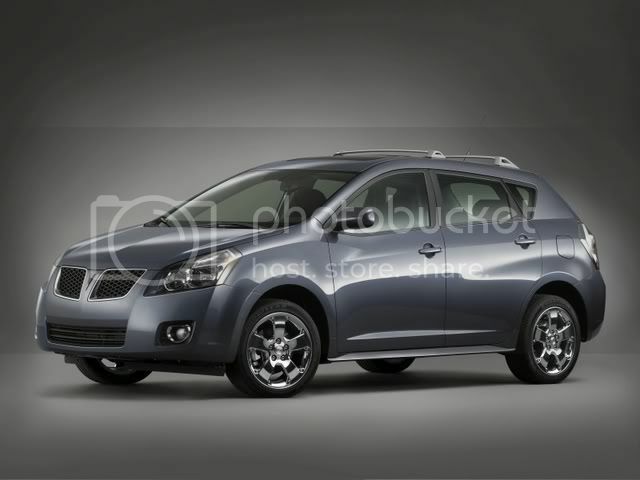 Introduced in 2002 as a ’03 model, the Pontiac Vibe was an immediate hit with customers who sought a contemporary, roomy utility vehicle that was also efficient. Sales topped 39,000 in that abbreviated first-year and continued to climb in the years after - reaching more than 64,000 in 2005. By the end of calendar-year 2007, total Vibe sales will number approximately 300,000.